All canines are microchipped using the PRO-id microchip system. We feel deep commitment of responsibility for every puppy we bring into the world and we are willing to put the well being of our canines ahead of all else. 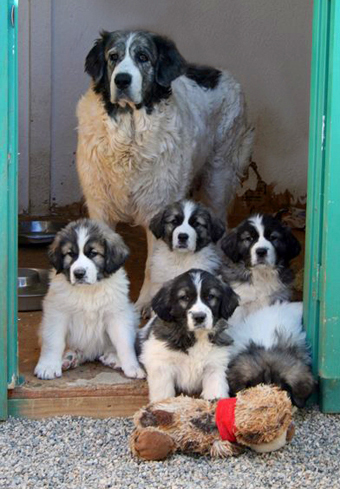 Our Pyrenean Mastiffs are a very important part of our family. We raise them in family groups so they can socialize and form bonds. Most of all they are raised with lots of love and attention. Lifetime homelessness guarantee - if at any point in time you are unable to care for your canine our facility will accept your dog back at any age (seniors welcome) and provide a loving home for him or her and/or find a loving and qualified foster home. Life at Tierra Alta kennel is always busy but especially with the arrival of a new litter or litters. The puppies are raised for at least the first three weeks of life close by where we can sleep with and monitor them and the mother. After this time they are transferred to one of two secure buildings constructed with the comfort of a growing litter in mind. Here the puppies will enjoy the rest of their time (up to age 10 weeks) playing with their litter mates and in the company of their mother. We get many visitors to our ranch and kennel - so once the puppies have received first vaccines and have some immunity they can be handled and viewed by those who come. Due to this factor they go to their new homes well socialized and in addition usually house broken. They keep their area very clean choosing to do their business in the large paddock surrounding their building. In the winter months the facility has heating and for the hot summer months a cooling system for comfort. We feed our puppies a premium food for correct growth and at the correct protein level. They have access to fresh water at all times and plenty of shade and toys and a comfortable area for sleeping. Our puppies will receive at least two of three vaccinations by the time they are ready to depart for their new homes. These 5 - way vaccinations are to prevent against Canine Distemper - Adenovirus Type 2 - Coronavirus - Parainfluenza - Parvovirus. They will also have received Bordetella as protection against kennel cough and four dewormings. Just before departure they will receive a full veterinary health check, microchip implant (Pro - id) and any necessary transport documents if a puppy is to be shipped to his/her new home. Each puppy will also have their own folder that contains: care and guidelines covering feeding and basic care and recommended do's and dont's for a first time owner, puppy health passport listing all of the vaccinations and dewormings received, microchip activation card indicating the chip number, copy of vet health report, transportation documents (where necessary) and application for pedigree. Show/breed potential puppies will be sold with full FCI/PMCA registration. Companion/pet quality puppies will be sold with limited registration. Our kennel wishes to ensure that our puppies have the greatest chance of succeeding in their new home so all puppies will only go to pre-screened and approved homes. Repeat clients will have first choice. All puppies are sold strictly under contract. New owners will receive weekly photo updates of their puppy and the litter by visiting our web site and Facebook pages. We keep these constantly updated and new owners can ask questions at any time as we are always glad to answer. Most owners choose to remain in contact over the years and send photos which we enjoy receiving and post for all interested to enjoy. Regarding shipping: we can ship to most main airports of the clients choice. We are known shippers with many of the major airlines and so our puppies fly very well. Prior to departure we purchase a crate of comfortable size - usually a Model 400 - since these are large puppies. The flight booking is made and flight information provided to the new owner. All documents and folder for the puppy will be attached in a plastic bag to the top of the crate. Important that the new owner makes sure they look out for this upon arrival. A bag of food will also be attached to the top of the crate. During the flight the puppy has access to food and water and we like to send along a favorite toy when possible. Once the puppy has arrived we do ask that the new owner would please send us a message either by phone, email or text to let us know that the puppy has arrived safely. Thereafter we look forward to future updates. 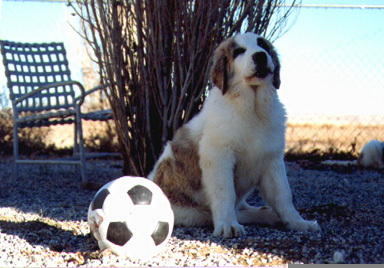 If you feel a Pyrenean Mastiff is the right addition to your family then please fill out our Prospective Owner Questionnaire. "Got a few minutes to play??"